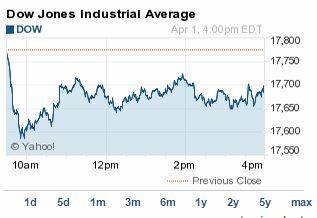 The DJIA Index plunged 77 points amid disappointing economic data as the second quarter begins. The S&P health care sector .SPXHC slipped 0.5% as investors sold stocks and took gains from a strong first quarter. It was a tough day for data junkies. Automatic Data Processing (ADP) announced this morning that private employers added just 189,000 jobs in March, well below analyst expectations of 225,000 jobs. This ends the nation's streak of reports above 200,000. In addition, a March report on U.S. manufacturing showed that sector growth has fallen to its slowest rate in roughly two years. The jobs report could be a harbinger of economic struggles in the first quarter. Although the markets are closed this Friday, the Bureau of Labor Statistics will report the March unemployment rate. The U.S. Federal Reserve will keep a close eye on the figure as it determines its timeframe for raising interest rates. Oil prices surged again today as investors continue to suffer bouts of volatility in the markets. WTI crude oil surged more than 4% despite news that U.S. crude inventories hit a new record and their 12th straight week of gains. The United States added 4.8 million barrels of crude to its storage capacity this week, a figure that was smaller than many analysts expected. Brent crude prices jumped roughly 3% on news that a deadline expired between Iran and Western nations to hash out a deal over the former country's nuclear ambitions. Airline stocks slid today on news of higher oil prices. This afternoon Deutsche Bank (NYSE: DB) downgraded airline stocks. American Airlines Group (Nasdaq: AAL) stock was the worst performer in the sector, falling more than 4.5%. AAL rival Delta Air Lines (NYSE: DAL) slipped 3.78%, while Spirit Airlines (Nasdaq: SAVE) dipped 2.86%. Southwest Airlines (NYSE: LUV), which has a strong reputation for its jet fuel procurement strategy, slipped 1.92% on the day. Stocks to Watch No. 1, GDDY: Shares of GoDaddy Inc. (NYSE: GDDY) soared as high as 34% in its public debut today. The IPO surge valued the web hosting and domain registration company to nearly $5.5 billion, including debt. The company initially priced its shares at $17 to $19, but opened at $20. Shares surged to more than $26 this morning. Here's a breakdown on whether GoDaddy is the right stock for your portfolio. Stocks to Watch No. 2, SHLD: Shares of Sears Holdings Corp. (Nasdaq: SHLD) jumped more than 3% this morning on news that the company will sell up to $2.5 billion in real estate to an investment trust. The announcement is the struggling retailer's latest attempt to raise capital as it undergoes a transition. SHLD stock ended the day down 0.12%, erasing morning gains. Don't listen to pundits warning of a biotech bubble. Ernie Tremblay understands the FDA approval process and the market demand emerging drugs better than almost anyone else. Get more biotech investing insight and stock picks from Tremblay here.